A mock-up of how the ad would have looked. 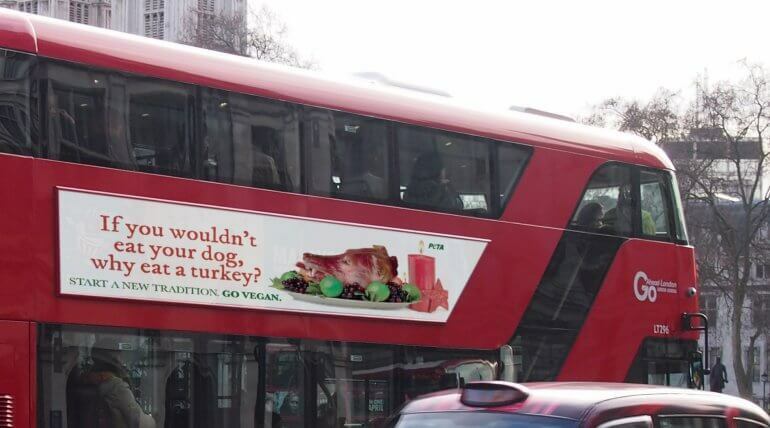 It’s shameful and confusing that PETA’s campaign was rejected by London Buses when Londoners are bombarded with ads selling turkey corpses. What’s truly offensive isn’t the ad but killing gentle birds – who have the same capacity to feel pain as the dogs with whom we share our homes – for a fleeting moment of taste. Turkeys, just like dogs and cats, have feelings and can suffer. The average turkey bred for meat in the UK will spend his or her short life in a space two-thirds the size of an opened broadsheet newspaper. Farmed turkeys are bred to have such large breasts that they can’t mate naturally and sometimes can barely walk. They’re intensively confined, part of their beaks is cut off, they’re pumped full of grain laced with antibiotics, and they’re slaughtered when they’re just 5 months old. PETA’s ad asks everyone to offer all living beings some comfort and joy this Christmas by enjoying a festive meal that doesn’t have an animal’s corpse as the centrepiece.